Since I'm already on this topic, and because it's still fresh in my mind, I've decided to throw out another Carnage related key issue your way. This time I'll tell you about Amazing Spider-Man #344. With Michael Mando being cast in the new Spider-Man movie, and the tweet that was sent out by "Better Call Saul", there are many that believe Carnage is going to make an appearance soon. I am probably one of the few that doesn't think that Carnage will be making an appearance, but rather Cletus Kasady will. I mean, how can you jump straight to Carnage without first introducing Venom, since he is the spawn of Venom after all. Regardless of what they do on the big screen, let's delve into the character of Cletus Kasady a little bit. He is a homicidal maniac and serial killer. The first time that we see him in this issue, he is locked up in prison with Eddie Brock. His bright red hair, Jack Nicholson eyebrows and Joker like grin make him a pretty creepy looking guy. Actually, he reminds me a little bit of how Carrot Top looks now, without all of the curls. When Kasady was a child, he murdered his grandmother by pushing her down a flight of stairs. He later tried to kill his own mother by tossing a hair dryer into the bathtub while she was bathing. Nice kid huh? But wait, it gets worse. Eventually, he ended up in St. Estes Home for Boys. Because of his antisocial behavior, the kids and staff at the orphanage would mentally and physically abuse him. To make a long story short, he burned down the orphanage, killing almost everyone inside. 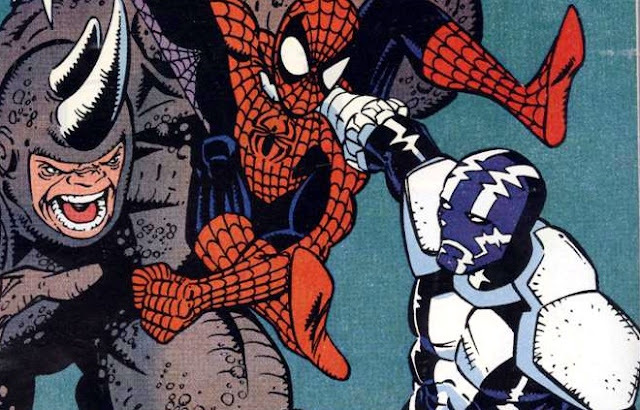 Although this comic is more known for the first appearance of Cletus Kasady, it also holds the first appearance of another character, the antihero Cardiac. the pharmaceutical company didn't release it because it wasn't profitable enough at that time. He subjected himself to a series of experiments that replace his heart with a beta particle reactor. The energy created from the reactor channels energy through his muscles, increasing his speed, agility and reflexes. He also had a mesh of vibranium implanted under his skin, thus creating the new hero Cardiac. 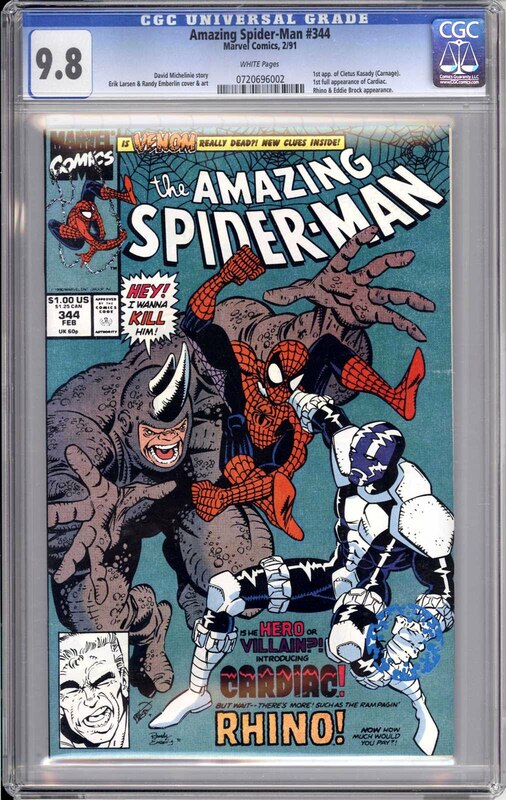 So far, there are only 658 copies of Amazing Spider-Man #344 listed in the CGC census. Don't let this low number fool you. This comic in not a low print run, hard to find, or rare. If you do an eBay search, a slew of ungraded copies will pop up. The reason for the low census numbers are simply that nobody is sending in their copies to be graded. Most of these copies listed are high grade, with four of them being ultra high 9.9 Mint copies. There are no sales figures for these at sites like Heritage Auctions or Comic Connect, but I'm sure that they would be pretty pricey, 9.8 NM/M copies on the other hand are still very affordable. The last few sales on the mighty eBay were in the $120 range. 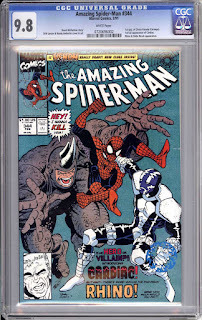 There are a couple of pending sales for the same grade at Comic Link that were below $90, so if you take a little time to hunt for a copy, you can probably get a decent deal on it. Whoever winds up showing up on the big screen in 2017, whether it's Cletus Kasady or Carnage, this comic could have a chance to see a little bit of action. I can't say that values are going to go sky high for it, but you might be able to scratch a little bit of profit out of it.